Does anyone think this lady might be expecting? 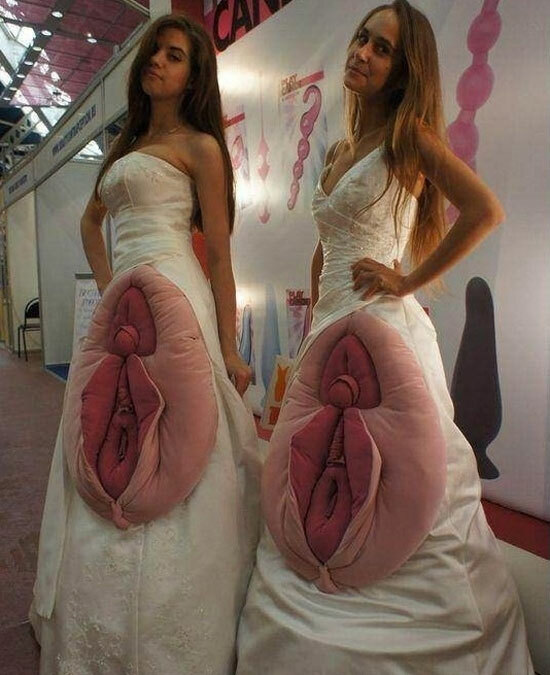 Rumours that there are women hiding somewhere inside these dresses are yet to be confirmed. 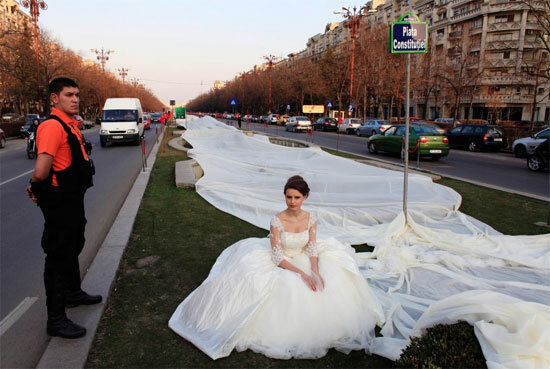 In Budapest, 17-year-old model Ema Dumitrescu dragged a 2750 metre long train behind her for this Guinness World Record attempt. 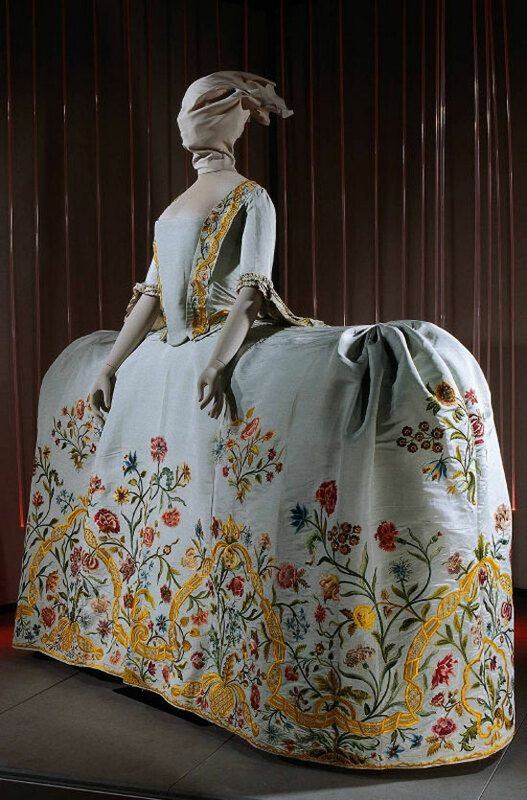 With 4700 metres of taffeta and 5.5 metres of Chantilly lace, the fabric alone cost £5000. 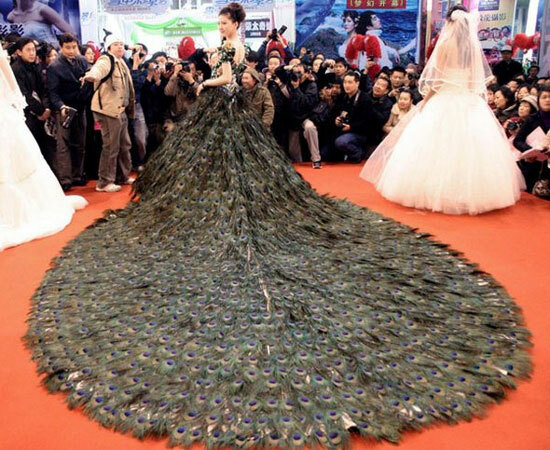 A bridegroom in the Chinese city of Guangzhou saw his wife-to-be's dress as the perfect opportunity to pay homage to the 2008 Beijing Olympics. At 200.8 metres long, the gargantuan gown was also the country's longest when it was made, which surely deserves a gold medal. It's hard to believe that this silly-looking design is by YSL. 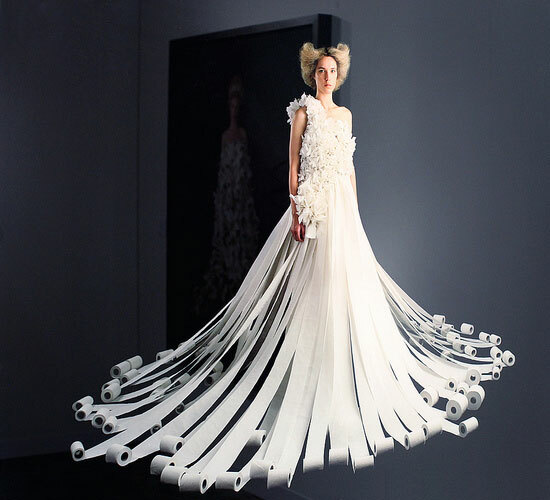 It dates back to 1965, when looking like a loo roll holder was all the rage. 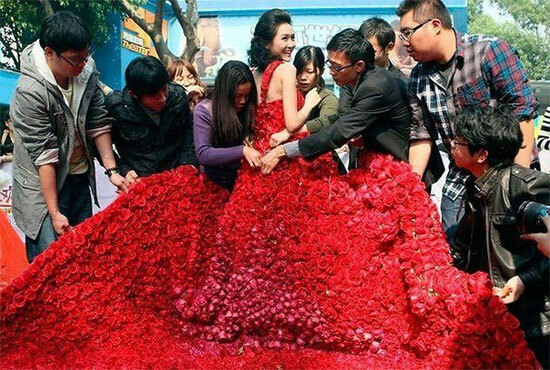 In China, Xiao Fan proposed to his girlfriend, Yin Mi, with a painstakingly-made wedding dress of 9,999 red roses. Thankfully, she said yes. 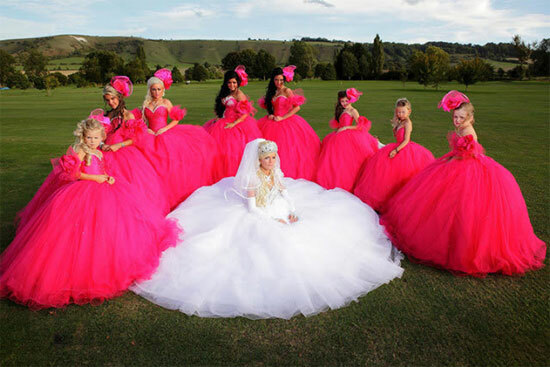 In Liverpool, wedding dress designer Thelma Madine of 'Big Fat Gypsy Weddings' fame got together with hairdressing salon Voodou to create this human hair frock. 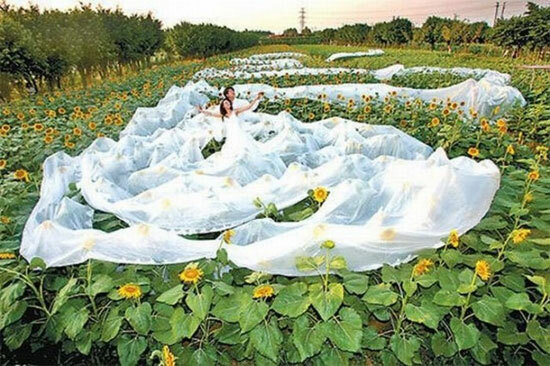 Eight people worked for around 300 hours to finish the dress, which was made of tens of thousands of individual hair wefts and 12 underskirts and probably never got used for an actual wedding. 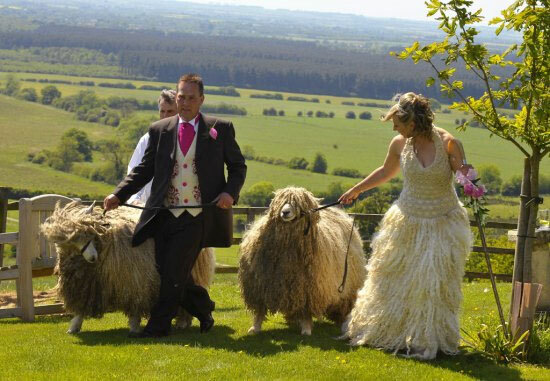 Shepherdess Louise Fairburn loves her rare breed Lincoln Longwool sheep so much that she crafted her wedding dress from their wool. What are the two most important things at a wedding? 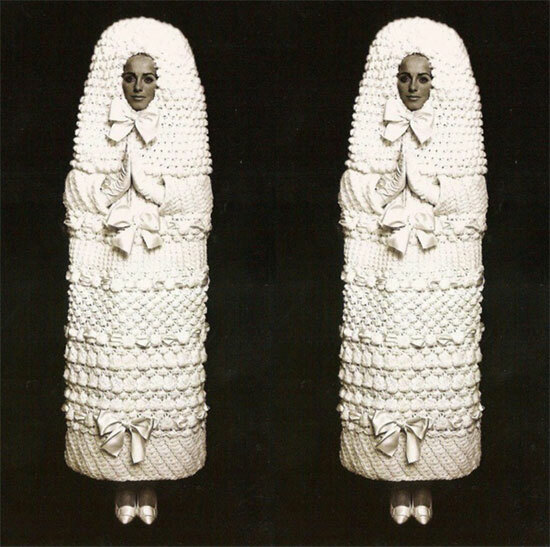 If you said the Bride and Groom you've clearly never been a bride. The correct answer of course is the dress and the cake. That being the case, why not combine the two for something a bit less traditional? 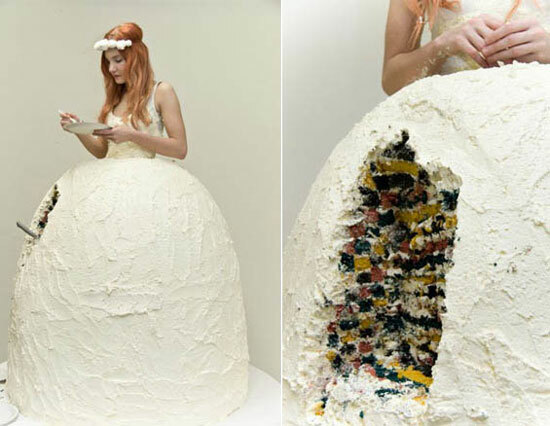 Designed by Lukka Sigurdardottir, this incredible, edible dress design lets you wear your cake and eat it too. 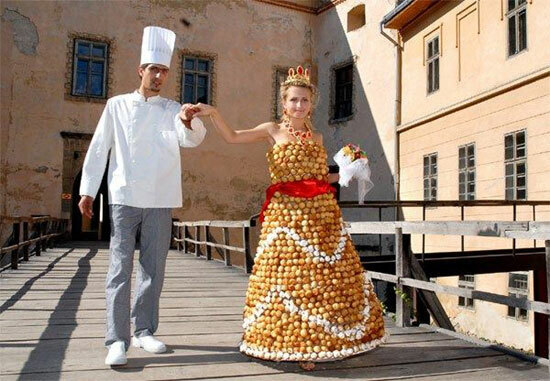 Ukranian pastry chef Valentyn Shtefano baked his bride's wedding dress, which is made predominantly of cream puffs (1500 of them, to be precise) . We're not sure how she went about sitting down.Or going to the loo. Or doing anything, except pose for this photograph. Why have a traditional wedding dress when you can just go for body paint? Just hope it doesn't rain on your big day. That could be embarrassing. 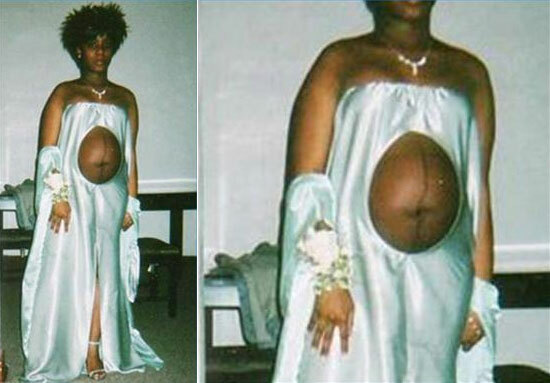 Shortly after this photograph was taken, the dress ate the groom. "Glamour" model Jodie Marsh puts her own unique take on the term 'bridal wear'. You'd really have trouble getting through the average church or registry office door in this number. Not just because of the width of it, but because of the blindfold. Sorry, veil. Can you believe the back of this peacock-feather wedding dress doesn't flip up and fan out? How disappointing. 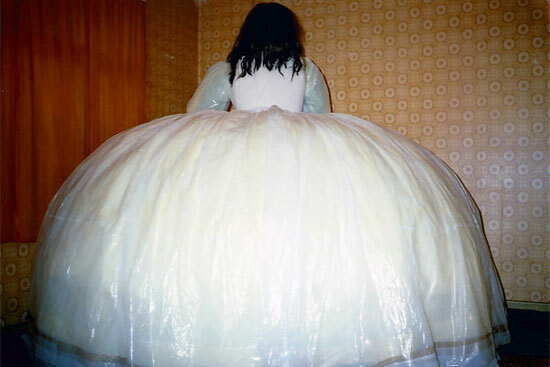 This inflatable dress can be made to order. Can you imagine the fun you could have at the reception with the buttonhole pins? Everyone has strapless dresses these days, so why not copy this lady and go for a unique take on the trend? Your guests won't know where to look and you'll probably have a wardrobe malfunction during the first dance but it's different, isn't it? When Karen Bell, a Manchester United fan, married Simon, a City Fan, she decided to surprise him. Using his old kits and a flag, she created this. 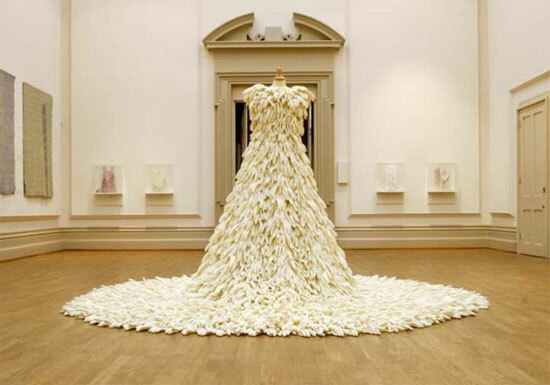 Artist Susie MacMurray used 1400 rubber gloves to create this avant garde gown. Reports say no dentists or doctors were harmed during its creation.